It’s a sweet story about death. 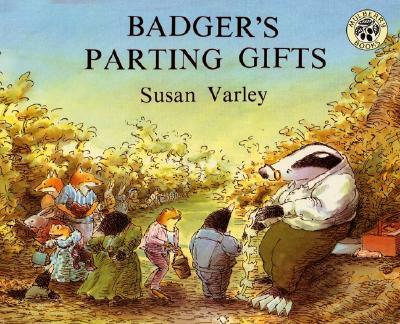 “Badger was so old that he knew he must die soon,” writes Susan Varley on the first page of Badger’s Parting Gifts. It was the first book that Varley both wrote and illustrated. And showing a first-timer’s ambition, she tackles the most important subject of all. The animals feel lost and alone, and the Mole cries the most, drenching his blanket with tears. But as the winter turns to spring, the animals began sharing their memories of Badger. Mole remembers how Badger had taught him how to make a chain of paper dolls shaped like moles. And in the illustration, the badger is back, kindly demonstrating the technique with spectacles on his nose. Varley is a British artist, and her drawings remind me of “The Wind in the Willows.” There’s a smiling frog who remembers when Badger taught him how to glide on the frozen lake. And like “The Wind in the Willows,” the animals wear fine jackets. In fact, the Fox remembers how it was Badger who’d shown him how to knot his tie! There’s charming details throughout the story, which make it feel more engaging. Mrs. Rabbit remembers the “wonderful fragrance of gingerbread fresh from the oven” after Badger had given her a cooking lesson. And one illustration shows the animals passing on the skills they’ve learned to other younger animals. The animals’ sadness melts along with the snow, but Mole stands on the hillside where he’d seen Badger for the last time. He says “Thank you, Badger,” believing that somehow his friend would hear him.